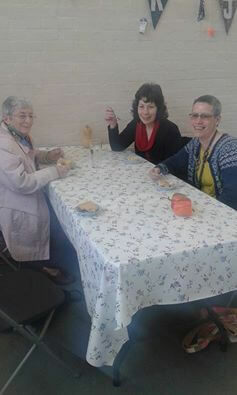 Last weekend I invited my Mum, Auntie and Grandma to visit the cafe. 1. Everyone is so friendly and there is a real sense of community and looking after those most vulnerable – such as the homeless and low-income families. I’ve met so many people from all ages and walks of life, which is so different and exciting from just meeting students as you tend to do at Uni. Not that I have anything against students – its just great to mix with different people! 2. The food is delicious! 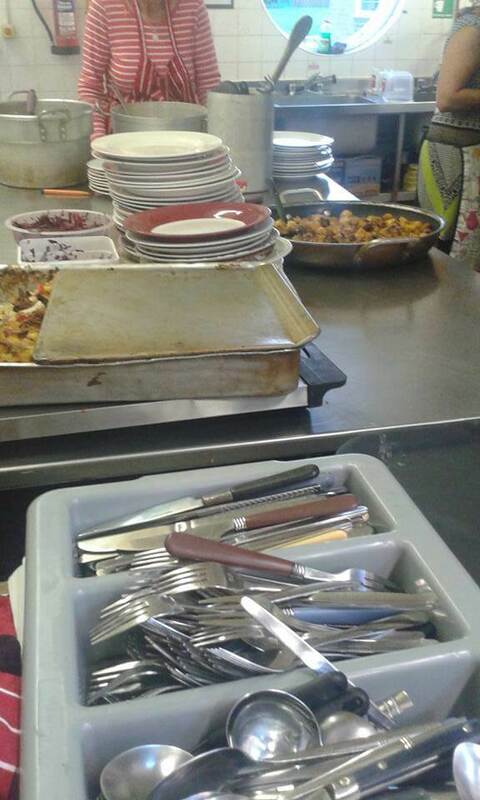 The volunteer chefs really know how to make a good meal, and are so inventive with using the food we intercept from going to landfill. I’m hoping to get more into the cooking side of things this summer and gain all their culinary wisdom! 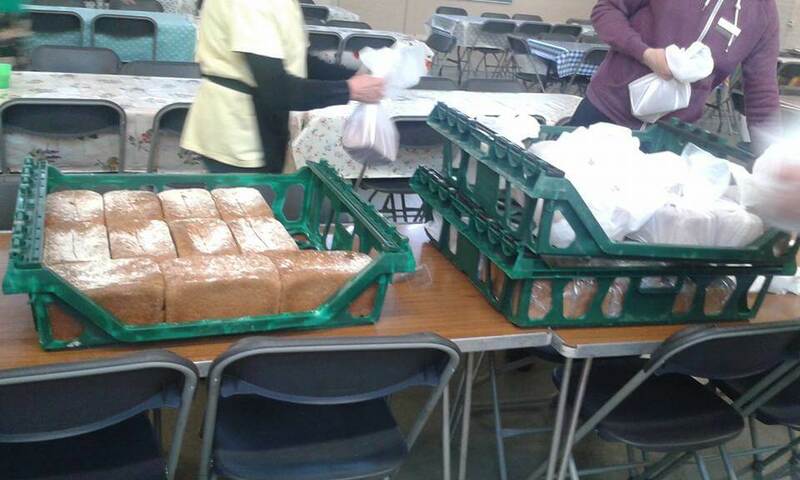 This bread was freshly made, however the bakery gave it to the project because they had missed one preservative ingredient which made it impossible for them to sell it. 3. It’s an environmental project which is right up my street because, as you might have guessed, I’m really passionate about sustainability and helping to alleviate some of the many environmental problems in our world. Did you know 15 million tonnes of food goes to waste in the UK alone? Most of this is perfectly edible – the reason it goes to waste is due to ridiculous food distribution and sell-by dates throughout the food supply chain. Another estimate suggests half of this figure is due to household food waste i.e. people thinking something has gone off when it hasn’t, or buying too much food and not being able to eat it. Meanwhile people are starving on our streets. What TRJFP does is get hold of the food before it goes to landfill. 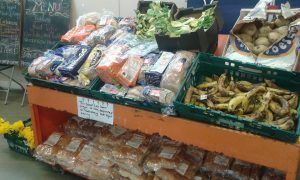 More and more businesses in Leicester are hearing about the project and are now ringing us up to give us their waste food! It just goes to show that they don’t want to throw it out, but the food regulations force them to! 4. The Food Boutique. Every week there’s a big shelf full of food that people can take home after their meal. I usually walk away with a load of bread, vegetables, and recently flowers – which honestly makes living on a student budget a lot easier! I also got 3 bottles of hair conditioner recently, which were being thrown out because of a little crack on the plastic. I’d love to volunteer there more, but it is quite time consuming and now is the key time to be focusing on revision for my exams. Once I graduate I plan to volunteer at every cafe. If you want to come down its on Thursday nights 7-9, and Fridays and Saturdays 11-3 at the West End Community Centre. Check out the Facebook page here. I’ve also taken on the responsibility of managing the Facebook page so keep an eye out for some posts from me soon! Hope you enjoyed reading this post, and be sure to support your nearest cafe as there are loads of cafes around the UK which you can check out on the website. See you soon! Hey! I'm Caroline and I'm in my second year studying BSc Geography. I have a strong interest in environmental issues and enjoy music, art and volunteering outside of studying. I'll be blogging about my course and life at Leicester as well as proving that Geography isn't just colouring in maps! It is a great project and it is good to learn more about it. Good luck with future volunteering!